For less mobile riders, mounting and setting off can be the most challenging part of riding, especially for those who haven’t ridden for many years, so for 2018 you can choose e-bikes with a “step-thru” frame for your cycling vacation in Britain’s fabulous Cotswold Hills. 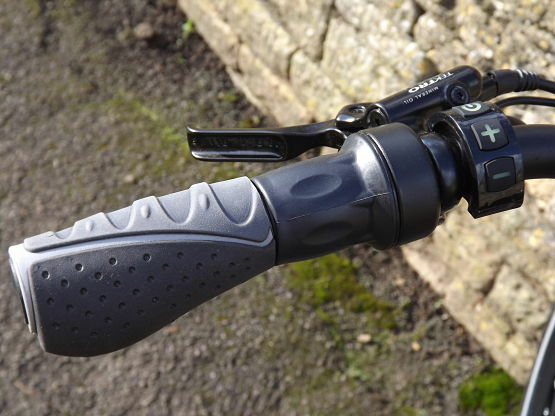 To make getting started even easier, there’s no need to pedal to get the bike moving – a twist throttle gently accelerates the bike up to 4 mph (6 kph), so you don’t have to worry about pedalling until you are already safely on your way. The throttle can also be used once your pedalling to give a short burst of power or can be used to power the bike when you are walking. Once on the open road, the bikes offer 2 different power modes – 4 “pedelec” power settings, which magnify your own pedalling effort and a “cadence” setting, which tells the e-bike motor to cut in as soon as the bike senses the pedals turning. The cadence setting is an effortless way to cruise around on flat roads, but does use more power from the battery. 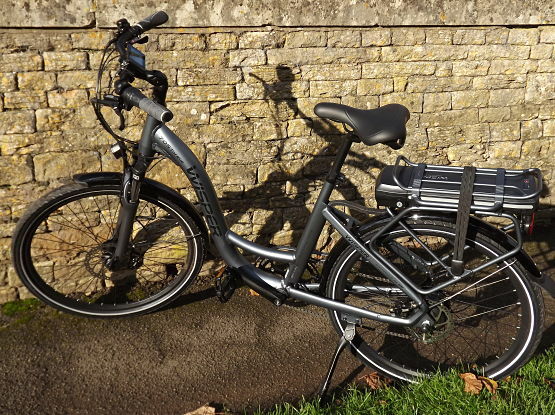 By using a mix of the 4 pedelec settings, teamed with the bike’s 8 gears, they have a range of between 50 – 70 miles (80 – 110 km) on the local terrain here, depending on how the bikes are ridden. Other great features of the bikes are a sturdy rack (to mount the panniers we provide); high power LED lights which can be left on to make you highly visible to any vehicles; large easy to read digital display; powerful hydraulic disc brakes; ergonomic handle bar grips and a comfy “Selle Italia” gel saddle. All in all, our e-bikes and our excellent customer care, will turn your dream of an amazing cycling vacation in the Cotswolds into a reality.